Fits 5-1/8'' Carb Necks. Includes Plated Studs, Wing Nut, PCV Attachment for use on Pollution Controlled Motor Vehicles, 2'' Paper Filter and Instructions. Add style plus better air flow to your engine with a Proform Air Cleaner. 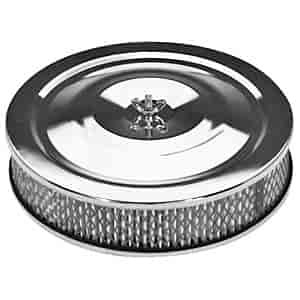 These air cleaners are triple chrome plated using pre-polished steel for a brilliant show car finish and they incorporate high CFM-rated filters for maximum air flow. Also available is a super light clear anodized aluminum air cleaner for a cleaner basic look that will also save you front end weight. 66815 is rated 3.5 out of 5 by 2. Rated 5 out of 5 by Bjack350 from Excellent product This is a very good product at a very good price and the fitment was perfect! Rated 2 out of 5 by JJ55Chevy from the filters are restrictive I replaced the velocity stacks in my car with these just because I wanted a closed top incase I got caught in the rain, the power suffered a lot. I bought some taller filters that I am going to try. Like the saying goes, you get what you pay for. This air cleaner has a 4-7/32&quot; Carburetor Neck . Will this fit an 89 chevy 1500 Silverado? Yes, as long as you have the stock throttle body on the engine. Will this fit on a 1966 ford f100 with an inline 6 engine? Yes, As long as you have a 5-1/8&quot; or 4-7/32&quot; air cleaner flange. Will this fit an 84 ford 302 with the throttle body injection ?